Growing up in a family of artists, I was always surrounded by crafty materials and encouraged to experiment. Working with watercolors, acrylics, crayons, yarn, fabric as well as copper enameling were my earliest adventures, until my hands came in contact with beads. I remember my mom pouring all her beads into a bowl and stashing it away in a corner cabinet. Often I would grab the bowl and just let the beads run through my fingers – I was hooked. As a young adult, I was drawn to long, dangling earrings with many fringes. However, I could not afford to buy any and so I decided to learn how to make them myself. In the 20 years since then, I took various classes, learned from books, taught myself and was inspired as well as encouraged by many beading friends. Mostly I am attracted to geometric shapes and a large variety of colors. Symmetry plays a big role in my designs. Achieving the impression and the feeling of fluid motion created with beads is my daily challenge. Each piece is made with the intent to be an accent to the person wearing it, and making that person feel special. Even after 20 years, my passion for beads has not diminished. There is not a day in my life, where I don’t feel excited that I “get” to bead. It could be in the middle of the night when I have the greatest designs and ideas in my head. 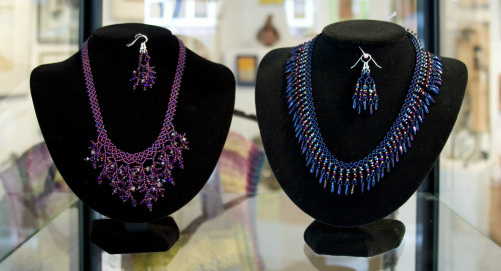 To this day, my specialty is pieces with long fringes using seed beads and crystals. My passion, desire and love for beads have shaped my life, and I hope it shows.